Markdownizr is a Google Chrome extension that lets you extract clean Markdown from web pages. If you like Markdown, plain text files, or being productive, then keep scrolling. Markdown is a simple markup language that adds semantics to plain text files. It was created by John Gruber in 2004. Once content is in Markdown format, the possibilities are endless - create PDFs, Word/RTFs, HTML websites, books, and more instantly. There are a veritable plethora of free (and paid) tools for Linux, macOS, iOS, Android, other operating systems, and even your browser. With Markdownizr, you don't have to manually format any content from a website to reference it in notes, cite it in your documentation, or whatever you may be plotting. To get started, select some text on a web page and click the Markdownizr "M" icon in the Chrome toolbar. The Markdown will be copied to your computer's clipboard so you can paste it anywhere. You can also right click and select "Get Markdown" if that makes you happy. If you want to copy the content of the entire page, just make sure that no text is selected and click the "M" button or right-click option. Done! Want even more power? Try adding a keyboard shortcut to super-charge your workflow. You can set keyboard shortcuts for plugins from the chrome://extensions page. 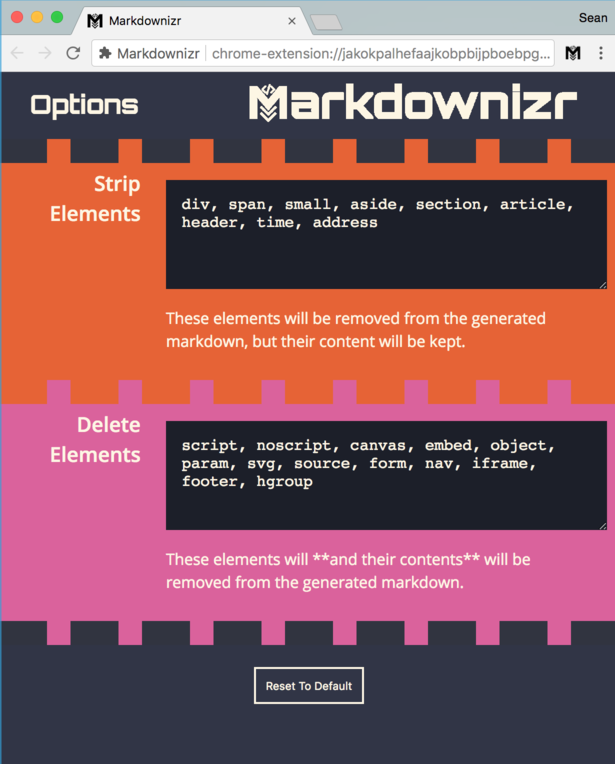 While other Markdown extraction browser extensions are locked in to a prescribed method of filtering out the html code, Markdownizr puts you in the driver's seat with simple yet powerful settings. This first text box is a comma-separated list of HTML elements that Markdownizr will take the content from, but delete the surrounding HTML tags (code). This box is the same as the first, but any elements here will be deleted entirely - inner content and all. Use this to get rid of unexpected cruft from <script> tags, etc. Markdownizr is and always will be free, open-source software. It was developed for fun and released because... well why not? The extension is 100% free of malware, ads, trackers, and gremlins. You can check out the source code on GitHub. Ready to up your markdown game? Markdownizr is available on the Chrome Webstore for free! If you're still not convinced, check out the interactive demo below. 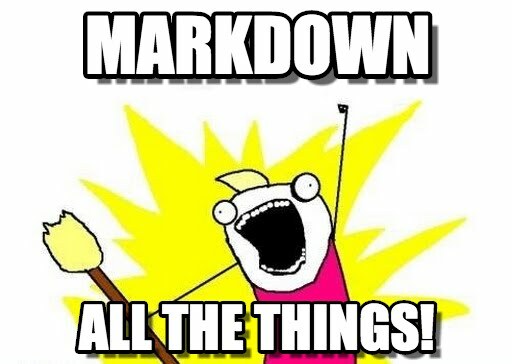 Here's a behind-the-scenes-sneak-peak at how Markdownizr chops up your HTML into sweet, glorious Markdown. Try pasting some random HTML into the HTML box!